The global inhalation anesthetics market is expected to register a CAGR of 4% during the forecast period of 2018–2023. The increasing number of emergency cases, including accident cases, emergency labor, etc., all over the world, is driving the inhalation anesthetics market. Inhalation anesthetics are majorly used for accident care, where, intravenous route of administration is not an easy task in ambulatory settings. In emergency labor, rapid sequence induction of general anesthesia is performed with intubation of the trachea. This method of administration is the standard of care for patients requiring emergency cesarean section because of severe fetal distress in the absence of preexisting regional anesthesia. Rapid sequence induction requires an intravenous route for drug administration. In few instances, intravenous access may not be available, and severity of fetal distress may mandate delivery before access can be obtained. Increasing geriatric population prone to chronic diseases, growing demand for a lesser duration of hospitalization, and increasing accessibility to health services are some of the other factors contributing to the growth of the market. Inhaler anesthesia drugs that are currently available in the market impose many side effects upon consumption. For instance, Sevoflurane causes nephrotoxicity, seizures, and post-operative complications. Isoflurane is associated with an intermediate risk for respiratory, circulatory stimulation, and hepatotoxicity. Desflurane is associated with a higher risk of respiratory irritation and circulatory stimulation than other anesthetic agents. A recent research study on the effects of total intravenous anesthesia and inhalation anesthesia in free flap surgery of head and neck reported that the total intravenous anesthesia was associated with significantly fewer pulmonary complications in patients, who received free flap reconstruction. Due to these side effects, there is a lower adoption rate in case of inhaler anesthetics in certain surgical procedures, which in turn, is hindering the market. 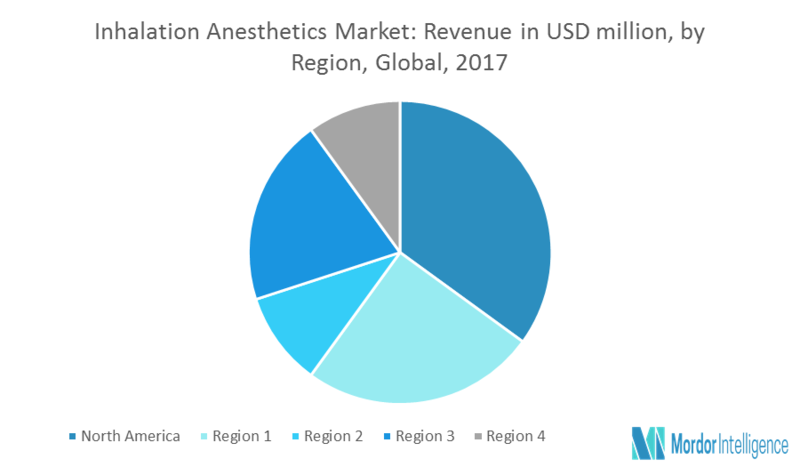 Additionally, generic competition for almost all of the halogenated agents and recent patent expiries are also restraining the inhalation anesthetics market growth. The global inhalation anesthetics market is segmented by type and geography. By geography, it is segmented into North America, Europe, Asia-Pacific, the Middle East & Africa, and South America. The United States inhalation anesthesia market accounted for the largest regional share in 2017. Increasing number of plastic surgeries along with rising prevalence of the chronic lower respiratory disease will fuel adoption of inhalation anesthesia. Key players are Baxter, AbbVie, Inc., Piramal Healthcare, and Lunan Pharmaceuticals Co., Ltd, among others. Market analysis for the global inhalation anesthetics market, with region-specific assessments and competition analysis on a global and regional scale. Analyzing various perspectives of the industry with the help of Porter’s Five Forces Analysis. Identify the treatment type that is expected to dominate the market.